3D printing is proving to be a versatile medical tool, and radiologists are at the forefront of its adoption. At 2015's annual RSNA meeting, there were four 90-minute, hands-on training seminars demonstrating the process of converting standard DICOM images into 3D models that could be used by surgeons and other interventionalists preparing for a complex procedure. Additionally, there were nearly a dozen educational sessions where researchers presented the results of studies that either focused on or utilized medical 3D printing technology, and examples of the technology's capabilities were on full display in the exhibition hall, including 3D printed models, charts demonstrating the process, and an actual 3D printer creating models in real time for attendees to see. The amount of attention paid to the technology at 2015's meeting may have felt to many like a sudden burst, but it has been a slow, steady climb, according to Frank J. Rybicki, MD, PhD, a professor and chair of the department of radiology and chief of medical imaging at the University of Ottawa, who moderated the hands-on training sessions at RSNA and has been a key member of planning medical 3D printing sessions at the meeting for the past several years. "Three years ago, I started the program, which was dedicated only to didactics. Two years ago, we had the first hands-on course and all 600 tickets 'sold out' in record time. This past year, we expanded to 360 minutes of didactics plus four hands-on sessions. Those were massively attended. Each year, the program gets exponentially bigger," Rybicki says. The entire 2015 hands-on program can be downloaded for free from the open access journal 3D Printing in Medicine (http://threedmedprint.springeropen.com/articles/10.1186/s41205-015-0002-4). Currently, surgeons preparing for complex surgeries often turn to 3D printed models to study a patient's specific anatomy prior to the procedure. Other uses for medical 3D printing include fitting and creating prosthetics for amputees and the creation of cutting guides for reconstructive surgeries. While medical 3D printing has only seemingly been reported on for the past several years, the technology itself has actually been around since the mid-1980s. According to a September 2013 article published by Engineering.com, 3D printing was first utilized in 1984 and was mostly used to test designs before moving forward with the creative process. In the years that followed, the breadth of 3D printing expanded, particularly as computer technology improved, and was adopted for use by those in the automotive and architecture industries. Then, in the early 2000s, the first medical uses began to be tested and, in the decade since, that field has exploded. "Everything that the domain of 3D printing has touched, it's dominated, and now this movement is focused on medicine," Rybicki says. The process of creating a medical 3D model is not dissimilar from an architect creating a model home; one of the main differences is that radiologists play the role of "architect." All 3D models use some form of computer-aided design (CAD) software, but for many fields, the image is created directly in that CAD program. For medical 3D printing, however, a radiologist must acquire a volumetric image data set (CT, MRI, or 3D ultrasound) of the patient. These images must then be converted from the standard DICOM format, which 3D printers cannot read, into the Standard Tessellation Language (STL) format using the CAD software. This conversion requires new expertise, but even after the images are converted, trained staff, generally the radiologist but possibly a trained surgeon or an outside company, must further adjust the STL data to the required specifications before finally printing the model. The actual printing time varies wildly based on the size and level of detail, but it can range from only an hour or two to many hours. The entire process, from imaging to production, can take anywhere from a single day to a week or more. At RSNA 2015, for example, Rajesh Krishnamurthy, MD, chief of radiology research and cardiac imaging at Texas Children's Hospital, presented a study that examined the use of 3D printing technology to aid surgeons in separating twins conjoined at the chest down through the pelvis and sharing multiple internal organs. He explained that, due to the complexity of the procedure, the process required four data sets and about three weeks to create 3D surgical models that the 26-member surgical team studied and used to identify several internal "landmarks" within the twins, as they prepared for what eventually was a 26-hour surgery. "The surgeons found the landmarks for the liver, hearts, and pelvic organs just as we had described," Krishnamurthy said. "The concordance was almost perfect." Cutting guides are created using the same basic method as the surgical models and are designed to aid surgeons in reconstructive surgery. To create a cutting guide, a radiologist uses image data of a comparable body part from a patient that was unaffected by the trauma and overlays that image on the affected portion of the body to create a cutting instrument that will meet the exact specifications required to treat the traumatized portion of the patient's body. "Instead of taking five hours in the operating room, chiseling out and manipulating a graft, 3D printing technology is used for cutting guides that customize the surgery with dramatically increased precision and large time and cost savings," Rybicki says. "It makes surgery so much better." In recent years, researchers have also experimented with creating prosthetics that fit better and are far cheaper to produce than traditional varieties. Although medical 3D printing has seen a recent surge in use over the past several years, it still faces a major hurdle to universal acceptance in the industry: reimbursement. Currently in the United States, neither private insurers nor the Centers for Medicare & Medicaid Services reimburse for the costs of creating 3D printed surgical models or any other uses of medical 3D printing, which has limited the number of facilities that are willing or able to aggressively pursue the technology. "Some people will wait for reimbursement and then start doing 3D printing, and that's reasonable," Rybicki says. "That's just a practical incentive, but people recognize that it's coming." Along with the costs of the procedures, 3D printing has some potentially daunting upfront costs. While a low-end printer can be purchased for only a few thousand dollars or less, top-of-the-line printers could cost as much as several hundred thousand dollars. Material costs also fluctuate based on quality, ranging anywhere from $50 or less to several hundred dollars. Finally, a software license for conversion software to convert the DICOM images to STL is also required, although there are some free, open-source options available. "I think there's a clear understanding that this is a valuable technology within the medical space, and the question a lot of places have is how to fund it and how to justify it within a tight budget environment," says Michael Gaisford, director of marketing for the Medical Solutions Group at Stratasys, a manufacturer of 3D printers and related 3D printing technology. "[The cost] is not prohibitive, but it does take an administration with a little bit of vision on the power of what the 3D printing can do." Medical 3D printing is already reimbursed in Japan, and calls for reimbursement in the United States have grown louder as more and more facilities see the potential benefits of the technology. However, while the lack of reimbursement and overall costs has remained a roadblock for many, some facilities actually view it as a "source of value" for training and research purposes, according to Gaisford. "While the surgical planning is an area where physicians and hospitals are trying to balance the budget requirements and constraints [of] adopting yet another technology with patient care, areas where reimbursement isn't an issue are in the education training and the device testing world," he says. "You see organizations like Boston Children's Hospital with their SIMPeds program; they're adopting 3D printing within their simulation lab for training physicians because it's something that enhances clinical realism and becomes a way to distinguish themselves within a competitive field for physician training and education." The Boston Children's Hospital Simulator Program, or SIMPeds, focuses on "perfecting an inextricable link between preparedness and high quality, high volume pediatric care," according to the organization's website (www.simpeds.org). This includes a 3D printing arm called SIMPeds 3D that serves as a "rapid 3D printing and prototyping service for surgical preplanning, pediatric device discovery, production, and research." Due to their skillset, radiologists play a key role in medical 3D printing. The volumetric data sets from patients required for the models are acquired in radiology departments, and radiologists are the natural workforce to convert those images to STL files, according to Rybicki. He does caution, however, that as the technology continues to evolve and once reimbursement finally arrives, radiologists could possibly end up in a less influential position, if they do not remain active in the process and in crafting standard operating procedures. 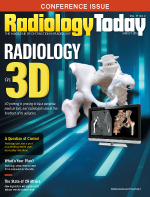 "Myself and other people think of the 3D printer as the 'new modality' in radiology; 3D printing hardware accepts these new files and prints medical models, but there is a whole lot of education, quality assurance, and clinical guidelines that all need to be developed and fine-tuned for 3D printing," Rybicki says. "Our role for the next several years is to get up to speed and, as radiologists, to make sure that we have a strong say so that we don't look back and wonder why DICOM images generated in our labs are being 3D printed in other domains. This has happened in the past and, by maintaining a strong role, we can ensure that [in the] future [it] is not repeated." While medical 3D printing has already gone a long way in changing the way surgeries are performed and increased the safety of many high-risk procedures, both Rybicki and Gaisford believe that, as the technology continues to evolve and its use becomes more widespread, 3D printing could have a greater impact on medical care. "Whatever you can imagine, you can basically 3D print, including bioprinting, where you're actually laying down scaffolds of cells with 3D printing that can then grow into living tissues," Rybicki says. Although that technology is likely a decade or more away, Gaisford believes that the utilization of the current technology will continue to be refined and improved upon as more facilities are able to afford the equipment. "I think that the adoption of current technology within its current capabilities is well below what it could be," he says. "While the technologies have been around for five, 10, 15 years, only now are people beyond the early adopters starting to see all the applications and benefits for them." While there is no way to know for sure if and when reimbursement will arrive, the use of medical 3D printing to treat patients is likely to continue to grow, as more printers are installed around the country and interest by radiologists and others in the medical field continues to rise. While that growth isn't likely to reach a crescendo until reimbursement is in place, it is also very unlikely to ever backslide. "Why would you do it like Fred Flintstone when you could actually do it like George Jetson? It's crazy to do things the old-fashioned way," Rybicki says. — Tony Fioriglio is the assistant editor of Radiology Today.